The cool luxurious feel of certain fabrics against your skin is something that cannot be replicated. Silk has long been a staple and status of luxury. For thousands of years only the most elite were able to afford this rare commodity. It may have been harvested by simple farmers but it had a tremendous impact on the trading world. As precious as gold and spices were, the demand for silk was even more. This creation of nature is still sought after today. Yes, the availability has increased but pure silk is something that is still a valuable commodity. This article will let you know about silks unique history and how it helped shape the world of fashion today. You may just find out something that you did not know. When was silk first discovered? Silks were discovered between 6000 and 3000 BC by the Chinese. The empress Xi Ling-Shi was the first to develop the silks into fabrics. But the rarity of silks meant that only the royalty had access to this precious fabric. Gradually through gifts and trade the silks made their way to various other parts of Asia. From Asia it was a simple matter of traders taking the silk fabric with them throughout the rest of the known world. For many centuries the Emperors of China hoarded the secret of cultivating the silkmoths in captivity. There is countless recordings or digs in which silks were discovered from around the world. What types of clothing can be made from silk? Any type of clothing can be made from silks. The key is not using just one strand though. Spinners have to combine several strands of silk in order to make a tough enough fiber to withstand the weaving process. Fabrics that are made from very thin silks can easily tear or rip apart. But to answer the question, you can find silken fabrics to make anything from. If you want a pair of socks…there are certainly manufacturers out there that can provide you with them. It is more common to find silks being woven into typical clothing items such as dresses, pants or shirts. The smooth quality of the fabric combined with its luster gives it a great appeal to virtually everyone. Who was the first person to mass produce silk? There really is not one single person who is written down in history as the first to mass produce silks. History does credit the Chinese for holding the majority of the market even up to this day. True mass production of silks did not come until the Industrial Revolution. Thanks to new weaving methods and machinery, more silken fabric could be produced. The Jacquard loom helped make silk embroidery easier and less expensive. How does silk come in so many colors? Silks are just like any other fiber that is woven. It can be dyed to any color that the manufacturer wants. There is a process though. First the fabric must be bleached to remove the natural yellow tint that comes from the raw silks. After it has been bleached out, dyes can be added in to reach the desired shade for the finished product. Quality silks will be dyed in a way so that you do not have to worry about bleeding or color run-off. 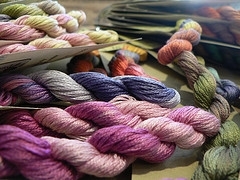 In the past when the dying process was done by hand, the colors were fairly limited with what could be dyed naturally. With today’s chemicals and varying shades of hues, a silken fabric can be transformed into a multitude of colors. This entry was posted on Friday, March 15th, 2013 at 9:21 pm	and is filed under Cross Stitching Supplies. You can follow any responses to this entry through the RSS 2.0 feed. Both comments and pings are currently closed.